We’re kicking 2013 off with a big bang! Next Wednesday and Thursday we are back in London for the first Seedcamp event of the year and it’s twice as big as before. Applications closed at a new all time high, hundreds of startups from across the globe eager to be part of the Seedcamp Family. We have over 70 of our best UK and international mentors signed up to attend and mentor the teams on Wednesday. The winners of the event will join current Seedcamp companies on the Thursday at Demo Day where they will have the opportunity to present to a room full of investors. One of the key points of mentoring is the identification of techniques and approaches that can help improve the day to day of building products, shipping code, and building a business. With that in mind, we are proud to have Devin Hunt of Dex.io and Lyst share his insights in a Masterclass on “Sketching Better Products”. Actual Reports, Tallinn, Estonia – A document generation platform combined with an easy-to-use editor and time-saving API for the developers. Babelverse, London, England – The universal speech translator, powered by humans. Before You Die, London, UK – A social bucket list that facilitates action & reminds you how extraordinary life can be. Carambla, Ghent, Belgium – Develops apps to help parking owners and cities drive traffic to available off-street parkings. GateMe, Tallinn, Estonia – A revenue-generating event management platform for nightclubs – OpenTable for nightclubs. HitMeUp, London, UK – Outrageous promotions going on around you right now. hull, Paris, France – A full stack social platform as a service. Build social apps with open, reusable components. Kinopto, London UK – Kinopto are going to change the way the world watches films at the Cinema. Little Eye Labs, Bangalore, India – Creators of little eye, the performance analysis and productivity tool for Android app developers and testers! Maily, Brussels, Belgium – Your kid’s first email. minubo, Hamburg, Germany – A curated, web-based BI solution for eCommerce merchants with the most sexiest front-end. Planvine, London, UK – Provides accurate and comprehensive event information which is powering what’s on guides across the globe. RecommendCare, London, UK – Helps you make the right care choices through recommendations from people like you. Saeker, Worcester, UK – Health & Safety managment in the Cloud. SilverPush, Delhi, India – Real-time Analytics backed platform for targeting & retargeting on mobile. Social Significance, London, UK – Application for hotels to monitor their ranking in the search results on travel websites. Subscrib, London, UK – A service that enables brick-and-mortar merchants to sell value-added subscriptions and learn about their customers. Toast, Berlin, Germany – Helps you find great gift ideas by collaborating with close friends. Together, Gothenburg, Sweden – Making the web a sharable experience in realtime. Our gratitude goes to our event partner, Thomson Reuters, for their support and for hosting us in their office on Demo Day. We would also like to thank our event sponsor, SoftLayer, who are sponsoring the drinks on Wednesday and of course not forgetting our yearly sponsors; Google, Microsoft BizSpark, Qualcomm Ventures and Paypal. Be sure to follow our blog, Twitter and Facebook accounts to follow the event on the day! Our visit to Paris was the last trip for the Seedcamp team in 2012. After 10 successful events all across the world, a huge US Trip in the spring, and an amazing Seedcamp Week in September, it turned out to be the picture perfect finish to the year. Our friends at Orrick hosted us, like in the previous two years, at their beautiful Paris office. Besides great teams from all over Europe, we had an impressive line up of successful mentors – no doubt because of leWeb happening just after. We heard well polished pitches by all teams in the morning, and jumped straight into a Master Class by three Seedcamp founders who shared insights and secrets of their entrepreneurial journeys. Philippe Laval, the founder of the successful address book update service writethat.name, shared how the company moved from a broad offering of various email services to their current laser sharp focus based on a religious concentration on customer feedback and tracking. Nicolas Steegman, the founder of video editing service Stupeflix, talked about his approach to hiring and building the company: the company only hired the absolute experts in their field and focused on maintaining a very good cultural fit. Andreas Klinger, cofounder of Lookk‘ took a different approach: his highly entertaining talk covered some do’s and dont’s from his experience and was a good way to reflect on a lot of critical decisions that are relevant for many startups. The afternoon was spent in mentoring sessions – as always, highly engaging and with a clear focus on connecting the startups with the world’s best startup mentors, investors, and entrepreneurs. Some of the highly rated mentors of the day were Jeff Clavier (Softtech VC), Jim Franklin (CEO, Sendgrid), Gabriel Hubert (CEO, teleportd), David Bizer (HackFWD), Steven Willmott (CEO, 3Scale), Ivan Farneti (Partner, DHTV), Colette Ballou (Founder, BallouPR), Craig Forrest (ex Apple). In total we had more than 100 participants on the day. § knowable.org, Berlin, Germany – a social network for makers. We were impressed not only by the vision Simon and Emanuel have for their target group of makers, tinkerers, and hackers, but also by their speed of execution on the product. § tldr.io, Paris, France – the Web, summarized by people. The team around Stan, Charles, and Louis took a great concept of the web and developed it further. If you use the product today, you will already see summarised content around the web – we’re sure the need for this will only increase in the future. § Unifyo, Cambridge, UK – helps customer facing employees to get 360 degree customer profiles inside any website while browsing. Ben is a well rounded entrepreneur and has built a product that can already be used in lots of circumstances – we’re excited be part of the journey. Our gratitude goes to our event partner, Orrick, for their support and for hosting us in their Parisian office. We would also like to thank our event sponsors, SoftLayer and Yammer, who make it possible for us to host such a great event, and of course not forgetting our yearly sponsors: Google, Microsoft BizSpark and Qualcomm Ventures. Sendgrid graciously stepped in as a sponsor for the evening drinks organised by teleportd, and made sure the evening went well, too. Last but certainly not least, we want to thank the mentors who took part in Seedcamp Paris for their time and hard work of getting the companies on track with their products, strategy, and fundraising efforts. 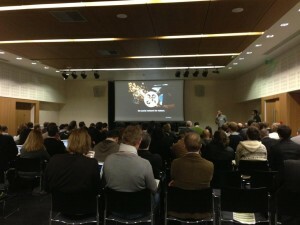 Not just at Seedcamp Paris, but throughout the year, we are incredibly grateful for your support.